A PLANE'S scary emergency landing sent panicked passengers in the United States leaping from a wing on to the tarmac after crew members screamed at them to get away from the aircraft, passengers and officials said. Southwest Flight 3562 took off from Phoenix, Arizona on Sunday night and was headed for Dallas, Texas. About an hour later, the crew noticed an unusual smell in the cabin, the airline said in a statement. 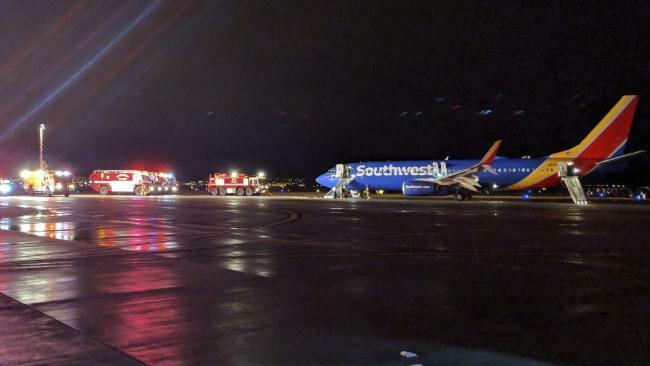 Passengers said they could feel heat from the vents shortly before the crew said the plane was going to make an emergency landing at Albuquerque, New Mexico. Passengers were told to brace as the plane landed. "I sent a couple [of] texts out to loved ones that you just don't really want to have to send out," Brandon Cox said. He said it was a 2.4m jump to the tarmac from the wing. "I hit the ground really hard and was just shell-shocked that I just had to jump off the wing of an aeroplane," he said. Video he posted on Twitter showed people using a slide connected to another emergency exit. A crew member can be heard shouting, "Move away from the aircraft now!" Passenger David Fleck said he was surprised to discover there were no emergency slides near the exit door over the wing. "It felt wrong when you're up there. It was dark, cold and rainy," he said. "It was disorienting. (You think), 'Do I really just jump down?'" The Albuquerque Fire Department tweeted that two people were taken to hospitals. The extent of their injuries was not immediately known. A Dallas police officer aboard the flight tweeted that Southwest's flight attendants "did a great job!" Southwest said it worked to get passengers on-board another flight to Dallas, and aircraft will remain in Albuquerque where mechanics will inspect it.